In this colorful homebrewing guide, The Kitchn's Emma Christensen gives you the keys to the brewery. Start out by mastering the basic styles, like A Very Good IPA and A Very Good Porter, then move on to inspired variations such as Centennial Dry-Hopped Double IPA, Campari IPA, and Smokey Chipotle Porter to discover which flavors, infusions, hops, and yeasts work best with each ale and lager. Want to brew a signature beer with your own personal stamp? Go wild with the "Make It Yours" suggestions and try tossing anything from cherries to chai spices into your brew. 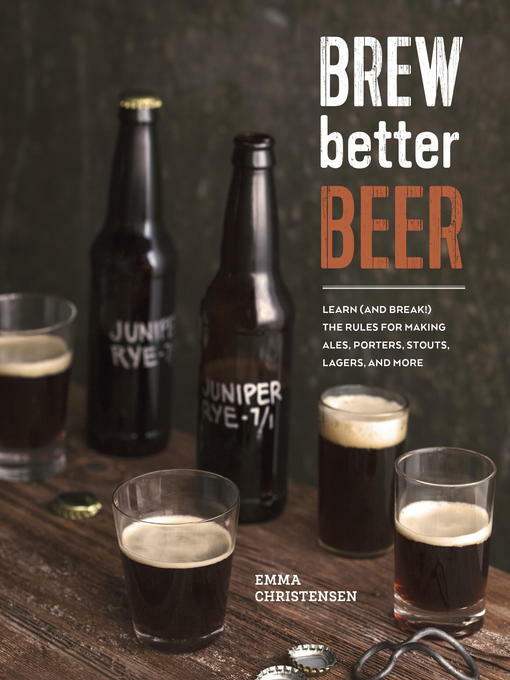 This handy manual also dives deep into the mechanics of brewing all-extract, partial-extract, and all-grain brews, and includes a big, beautiful photographic guide to brewing beer so you can see exactly how each step is done. You can brew small 1-gallon batches, perfect for apartment brewers and low-risk experimentation, or brew 5 gallons and have enough to share with all your friends. You'll also be introduced to up-and-coming beer trends like rye malts, barrel-aging at home, sour beers, gluten-free beers, and Old World beer styles. Filled with inspiring recipes like Riding Lawn Mower Pale Ale, Maple Cider Dubbel, Finnish Juniper Rye Sahti Ale, Figgy Pudding British Barleywine, and Farmers' Market Gruit, Christensen's accessible approach will have you brewing better beer in no time.